MAGNETIC Neck Fasteners make them easy-on, easy-off and allows your child (or you) to put on the Supercape & I quote "all by myself". 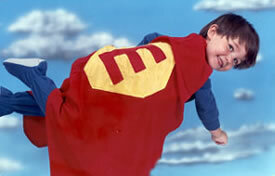 Our capes are individually-sewn, high quality and come in a variety of colors and sizes. They are professionally Embroidered and can be Customized with your Initial, Name and Lettering. The capes usually take about 4 business days to make (a little longer for a personalized or custom cape). Arrival time depends on the shipping method, and your destination (we're in California). © 2019 Supercapes.com. All rights reserved worldwide.